Medium High Voice. Edited by John Glenn Paton. SmartMusic; Vocal Collection. 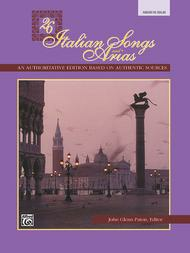 26 Italian Songs and Arias. Renaissance and Baroque. Collection. With vocal melody, lyrics, piano accompaniment, performance notes and introductory text. 153 pages. Alfred Music #00-3402. Published by Alfred Music (AP.3402). ISBN 088284489X. 9x12 inches. English. This authoritative, new edition of the world’s most loved songs and arias draws on original manu-scripts, historical first editions and recent research by prominent musicologists to meet a high standard of accuracy and authenticity. Includes fascinating background information about the arias and their composers as well as a singable rhymed translation, a readable prose translation and a literal translation of each single Italian word. As a freshman college music student, this book is extrememly helpful. The phonetics makes singing Italian that much easier for anyone who hasn't had much experience singing in a foreign language. Worth the investment! 29 of 53 people found this review helpful.